As work continues to develop the country's thriving tourism industry, the Philippine Ports Authority revealed that the government has identified eight ports across the country that it will develop as a gateway for cruise tourism in an effort to take advantage of the rising demand for cruise holidays in Southeast Asia. According to Juan Sta. Ana, General Manager of the Philippine Ports Authority, eight ports were identified for cruise tourism development in coordination and partnership with the Department of Tourism and other government agencies. The ports identified include Davao, Bohol, Boracay, Cebu, Metro Manila, Puerto Princesa, Subic, and Zamboanga. "These make up the country's major nautical cruise arteries," said Sta. Ana. "In addition, we have lined up various port development programs for the country's cruise terminals including Puerto Princesa, Currimao in Ilocos Norte, and Catagbacan in Bohol." He added that in light of the strong demand for cruises in the Philippines, the port authority would commit its support to the country's cruise industry. Sta. Ana remarked how the Philippines has been successful in attracting a growing number of large cruise vessels and major cruise lines in recent years. "The Philippines welcomes the growing interest in cruise tourism in various locations around the country," said Sta. Ana. "In fact, there have been a number of cruise vessels that called in some of our ports. To name a few, we had in March 2010, a German cruise vessel carrying 300 European tourists that docked in Iloilo port. 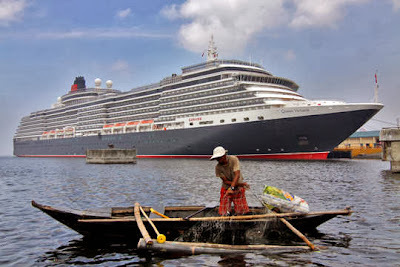 In March 2012, we had a Portuguese luxury cruise ship that docked in Davao and in March 2013, we had the Royal Caribbean, Legend of the Seas, which docked at Puerto Princesa in the Southern Philippines." Sta. Ana is hopeful that the cruise market in the Philippines will one day catch up to the thriving cruise tourism industry found in Europe and the Carribean. He added that the development of cruise ports would support the country's status as one of the major cruise destinations in Asia. Most recently, Manila welcomed the Superstar Gemini vessel on October 18 for the very first time along with her 1,200 tourists from China at the Pier 15 Super Terminal in the South Harbor Port Area. "This special charter cruise has brought more than 1,200 passengers from Xiamen to Manila to experience the many attractions this energetic city has to offer," said William Ng, CEO of Star Cruises. "Many of them will also visit Resorts World Manila, our world-class, one stop, non-stop entertainment and leisure hub, during the shore excursion." The Superstar Gemini also paid a visit to Boracay the previous day. The vessel boasts more than 765 cabins and 11 restaurants and bars spread across 13 stories. The ship offers a range of cuisines, endless entertainment, and a spacious shopping area in addition to a fully equipped health club, spa, and beauty salon. With 7,107 islands, the Philippines is a natural fit for the cruise tourism industry and Filipinos can expect to see a number of new vessels arrive in the years to come.